The realm of Castle's Wood is in despair. As famine, war, disease, and natural disaster wreak havoc upon the land, good King Jonathan seeks the counsel of a wise old Soothsayer. "Seek ye out the Orb of Stars," she tells King Jonathan. 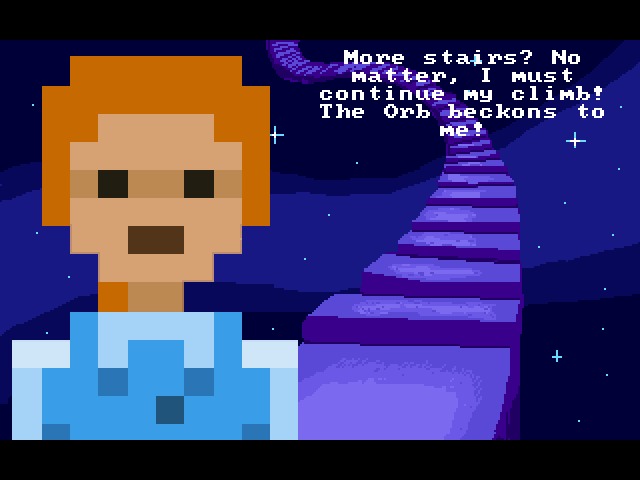 Says the King, "The Orb of Stars is but a legend!" The Soothsayer replies with a sly grin, "Even in legend may one find the truth, m'lord." Stair Quest is a retro adventure game that pays homage to the most enchanting, pulse-pounding moments from the early King's Quest games. 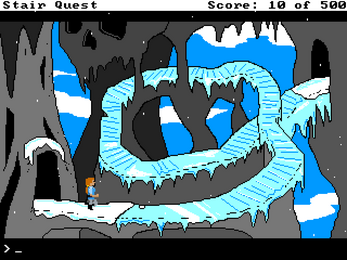 Gorgeous EGA graphics inspired by classic Sierra On-Line adventure games like King's Quest and The Black Cauldron! An innovative text parser that recognizes literally thousands of commands! Multiple protagonists! Choose to play as either the brave Sir Devon or the daring Princess Ingrid. An original 8-bit soundtrack so good it could pass as a 9-bit soundtrack! Developed for AdventureJam 2016 by No More For Today Productions (Patrick Johnston, Gareth Millward, Jess Morrissette, Frederik Olsen, Troels Pleimert, Chris Ushko, and Kevin Wallace). 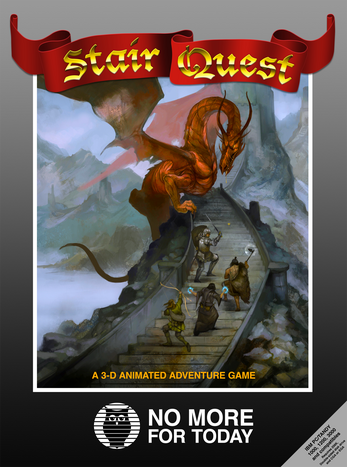 Cover art ("Roll for Initative...") by Jon Hodgson. Cover design by Andy Couch. Really enjoyed this one, lots of memories fading back! Homocidal, unfair, horrible cake with nice retro computer music and scenes and excellent writing. Now... we loved those games, but we had to try to finish them in one sitting... the game could only ever be tackled right from the start. You can imagine, there might be a bit of tension in the room - 3 brothers huddled around the monitor - when it came time to walk the path of thorns, to try to reach Dracula's castle across the poisoned moat in KQ2. Oh, my, god. And that path of thorns was so unforgiving, sooooo not-even-laid-out-fairly-or-intuitively to know which footstep might be your last... and we had no save. One bump of a thorn and the entire game had to be played from the beginning! Once! Once upon a time... we made it. Oh the delight to see inside the castle! What was in there? What awaited us there?!? A circular stairway, leading up. My brother and I (twins), were asked to leave the room while our older brother attempted the climb. He promptly fell down and died. At this point, he deemed it appropriate to get scissors and cut the disk into "8 even pieces". Not something I approved of at all, and yet, it seemed somehow like a justifiable reaction. This became a long standing family quote, and "fond memory" of playing Sierra games in our youth. Thanks! Glad you enjoyed it. You could probably tell that our entire team was raised on Sierra adventures. :) Totally. 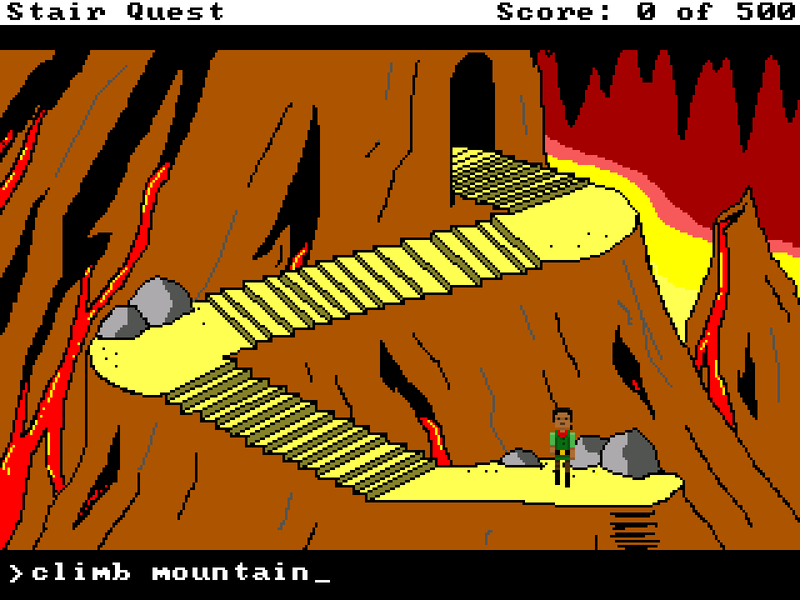 I think King's Quest 3 was my favorite, partly due to my own age and engagement at that time in history... the leap forwards in coherence of setting and storytelling was immense! 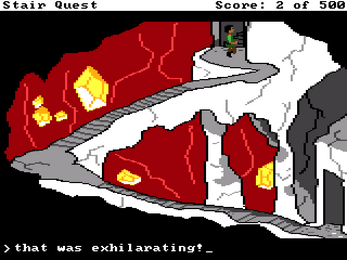 Your sweet EGA style graphics capture the feel of those screens - that world I got so involved in - so well! I was immediately put in mind of the winding mountain pathway to get down from Manannan's house atop the hill! Keep it up! So good. :P I wonder if there is more fertile ground for this approach to game making. I so enjoyed Peasant's Quest, too, for it's brilliance as a parody, but also as a really fun little game! At least there were no ladders.